Venice Artist Arrested and Jailed, Faces Felony Vandalism Charges - Yo! Venice! Venice artist Robin M., who has spearheaded some wonderful art projects around town via Venice Public Art such as Abbot Kinney Reflected and the Venice Neighborhood Book Park, is facing Felony Vandalism Charges (story below). Are you a criminal defense attorney that can help Robin out (hopefully for free, in the name of art!)? Click here to email her! 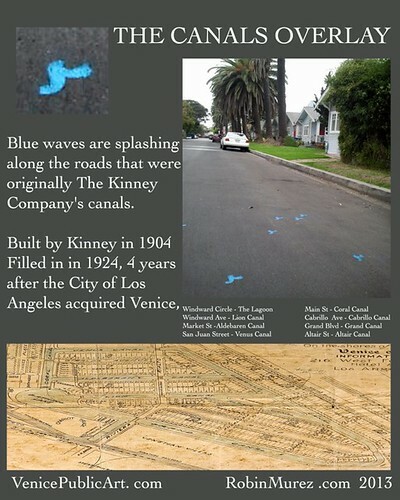 There I was, Sunday morning, wanting to spruce up the hood in time for the Venice Garden Tour, painting pretty little waves on Cabrillo, around the corner from my studio, one of the streets that was originally a canal, chatting with passersby who, when they saw what I was doing, said “cool” … when a police car pulled up and arrested me. Apparently a cranky neighbor who never spoke to me, and likely never saw what I was painting, called the police and insisted that they take me in. I was handcuffed, booked, jailed and after 12 hours, released on bail, charged with Felony Vandalism. CRAZY! I may need to get signatures of support from neighbors. Know a criminal defense attorney? Fear not, I continue to create more public art projects for Venice … just not ones painted on Cabrillo.